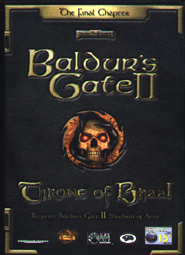 Baldur's Gate II - Throne of Bhaal is an expansion product to Baldur's Gate II - Shadows of Amn from Interplay. 'Continue the epic saga and fulfil your destiny in the ultimate conculsion. A storm of chaos and desctruction thunders across the Sword Coast. As towns are laid to waste and great cities burn, there are whispered rumors that the Children of Bhaal are responsible. Soon the whispered rumors become panicked cries - if the prophercies of the Wise Alaundo are to be believed, there is greater suffering ahead. And should Bhaal somehow rise again, the earth itself will weep blood. In the final chapter of the Bhaal saga, return to Baldur's Gate: Shadows of Amn and unravel the mysteries of a dangerous new dungeon - Watcher's Keep. Continue with an exhilarating new adventure when you explore unseen lands, encounter fierce villains, and gain powerful high-level abilities as you achieve your ultimate destiny in Baldur's Gate II: Throne of Bhaal. Venture into a deadly new dungeon - Watcher's Keep and come face to face with Demogorgon, Prince of Demons. Cast powerful new spells like Wish and Bigby's Hand, as your character climbs as high as 40th level - with an experience point cap on 8 million! Gain amazing high-level abilities: new combat feats for fighters, deadly new traps for thieves, special quest spells for clerics and 9th level spells for mages. Play a new character kit, the Wild Mage. 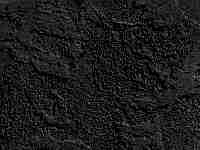 Check out the official Baldurs Gate II: Throne of Bhaal web site. See also the Baldur's Gate II: Throne of Bhaal novel.